I have chosen the oft-quoted Sylvia Plath as the driving force of my post today. If you don’t have a copy of The Unabridged Diaries of Sylvia Plath (I don’t know if that quote is actually in that book), then I highly recommend it. In the late-night (more like very early morning) hours, especially in winter for some reason, I enjoy delving into some other writer’s broken brain for a while. It makes me feel slightly less alone on a lot of cold, dark nights. Also, slightly less broken. Mostly, though, what I like about reading diaries or these more introspective personal works by famous authors is that they are windows into the people within the words. And what I’ve found most interesting is that many writers share a common sort of psychological need for motion: the motion of passing moments into meaning, and meaning into something more enduring. This often indescribable need to set words free. Each time I ponder Sylvia Plath’s words above, I think of the voice—the Voice—within myself that has always driven me to write. Not the conversations that go on in my head sometimes between characters while I’m walking down the street, or even the words I’m writing in my mind on the bus about the passing scenery or one lone passerby on the sidewalk. No, though these are all part of the thing in me that is writing, these are not what moves me to write. What truly moves me into putting words down is this feeling—this intense urge—that if I don’t write, I will shatter. The crack starts out small, but it grows and grows and grows. Before I know it, I’m breaking open in words. My relationship with words has always been a tenuous love affair. Though I cannot imagine a life without language, I often feel as if words dictate me rather than the other way around. I can go weeks sometimes without writing anything emotionally substantial, but the Voice, like carrion waiting on the fatal blow, circles and circles and becomes almost too heavy to carry; all those words I’ve stored up start to push back. And then BAM, I crack. Before I know it, I’m back at the computer or paper and away I go, back in motion, exhaling the Voice, releasing the words, so that I can, however briefly, come to a standstill. As a confession: Sometimes I truly hate writing. You know how it is, when you’re trying to build a habit. Not to write sporadically but to sit down every day and coerce the words onto the page. Sometimes, despite the insistence of the Voice, it’s a real fight. But I love the silence within me that arrives after having written. I love feeling, however briefly, that I’ve moved some part of myself forward in the process, and, in doing so, arrived at a crossroads where nothing moves at all. Only when I reach this point do I actually appreciate writing, at least the act of it: when my Voice is sated and my words are still and I am totally silent. What does your writing Voice tell you? 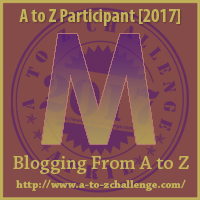 This entry was posted in A - Z 2017 and tagged A - Z 2017, Michelle Mueller, writing. Bookmark the permalink. For me it’s a buzzing that builds up and irritates. When I write, the buzz dies down and I’m also calm inside. I can get by writing on the computer, but to make the buzz fade the most, I need to write by hand. I’d say it’s a bit like a drug addict in the build up to giving in to their drug of choice, if that makes sense. How beautifully u have written i love it and yes its right writing is difficult sometimes but its the best way to express ur feelings and to know better you also. Thank you Bhavna for your kind words. 🙂 I am sorry for my late reply to your comment, and I appreciate that you took the time to reach out and share your thoughts.